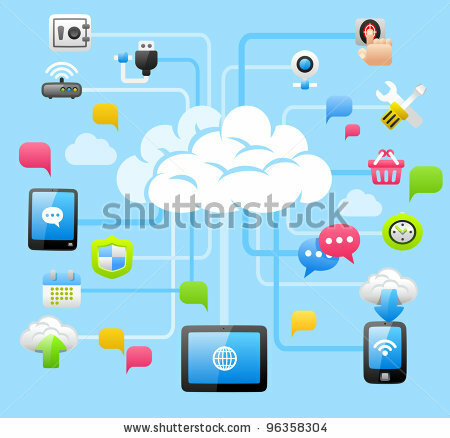 Cloud Computing has been the buzzword in the last few years and is destined to evolve in the coming years. IzelTech has undertaken a number of projects in this domain and our in-house engineering team has developed considerable expertise in Cloud based Disaster Recovery, Cloud Computing, Archival, Backup and Retrieval.We have a thorough understanding of the HTTP and SOAP and REST based APIs exported by most of the leading cloud vendors. This lets us work with both cloud platform providers as well as cloud-based application development vendors . Our expertise in the storage and virtualization domains blended with our cloud expertise helps our clients leverage the cloud as the preferred platform for their storage and archiving needs. Further, we have the expertise to implement content offloading and archiving to the cloud, combined with our own pluggable sub-systems for encryption/decryption, compression/decompression, logging/reporting/event-mechanism, versioning, online/offline replication etc . We make this process extremely secure by using stream/file dissembling techniques. Not only is data dissembled, it can also suitably be replicated across multiple locations in the cloud, as well as across different cloud vendors . We have developed a “caching” mechanism based on thresholds driven by varied parameters for optimized data transfer to and from the cloud to the enterprise data storage using standard protocols like NFS, CIFS and WebDAV, in a highly secure manner. This mechanism also reduces network overheads by implementing WAN optimization techniques. The local data gets written to the cloud in a lazy manner . Overall, at IzelTech, the development and qa engineers are well-grounded in offerings such as AWS, Azure, Rackspace andInstaCompute. We believe in knowledge sharing and hence organize TechTalks wherein the knowledge gained in such state-of-the-art technology is also passed on to the rest of the IzelTech engineers . Appliance based solution to improve data access performance through local storage caching. Integrated access to multiple Cloud Storage vendors. Availability of Cloud data over standard file sharing protocols like NFS, CIFS, WebDAV. Integrated backup and recovery of Cloud data. Integrated data manipulation functionalities like encryption, data duplication, compression, etc. Creating custom AMI’s and AKI’s on EC2Integration of custom applications with Cloud Computing. We have also provided Implementation of RAID on file level software formultiple Cloud Storage Vendors. Research experts state that 80 percent of enterprise data is unstructured data and is growing exponentially. There are a lot of benefits in managing unstructured data in the cloud. Reduce Storage Infrastructure costs: You pay only for what you use. There are many ways in which the unstructured enterprise data can be selected for being stored in the cloud. Policy based – Even a Policy based replication can be done in cloud for improved availability and a DR solution. The future of managing unstructured data with highly improved flexibility, affordability and scalability is the Cloud. IzelTech can help you build a highly reliable Cloud based Unstructured Data management solution. More and more organizations are shifting their backup, archival and DR solutions to the Cloud. The reasons are obvious and IzelTech can help you build such solutions. The most important factor the infrastructure team faces is to manage costs associated with the infrastructure required now and to keep operations ongoing for future. Any on-premise backup or archival solution will need upfront payments to be made. This would also mean scoping their capacity requirements based on guesstimates. This usually leads to over provisioning. By moving to Cloud, the costs are highly reduced. You pay only for what you use and with ease and assurance of scalability; it provides a fast, reliable and manageable solution. An entire cloud or a hybrid on-premise / cloud solution for Backup/DR/Archival can be highly rewarding considering the reduced costs, improved availability and still ensuring control in your hands. The Cloud provides with a number of features and services which can be used to build such solutions. Replication across geographical locations and reliability to sustain natural disasters assure that the data is safe and available when you need it the most. At IzelTech, we can help you build solutions catering to Private cloud, Public cloud and Hybrid cloud. Get your queries and discuss the obstacles you face with our experts who can guide you to the best fitting solutions. Cloud based data protection becomes necessary/useful when the business grows over multiple locations, the staff is mobile and there is a need to backup critical information from any place. Cloud based data protection helps best in this situation as it not only offers a cost effective solution but also provides with flexibility to restore the data when you need it and where you need it.